Yesterday, I headed to The Great Serpent Mound in Adams County for some research. It will be an important locale for Book 3 in the Midnight Guardian series. Part of southern Ohio history, the mound was created by an early people in the likeness of an uncoiling snake with an egg near the snake’s mouth. Scientists first believed that the Adena people of 800 BC – 100 AD built the effigy. Burial mounds located near the serpent were from that time period. However, more recently evidence was gathered that indicates the mound could have been built by the later Fort Ancient culture (1000-1550 AD), which had a nearby village. 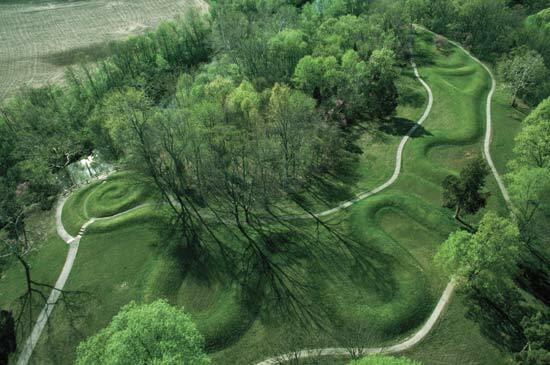 My grandmother first took me to Serpent Mound as a little girl and I was always intrigued by it. Walking the trail, there are signs to point out how the serpent was laid out in conjunction with sunrise and moonrise, aligning with the solstices. At approximately 3 feet tall and over 1300 feet long, the mound is an amazement…considering that the bulldozer hadn’t yet been invented.